Soak the Green peas 4-6 hours & pressure cook with salt until three whistle & strain it. If using frozen peas no need to soak or boil. Heat oil in a pan, add mustard seed,urad dhal, g.chillies,ginger,curry leaves & saute few seconds. 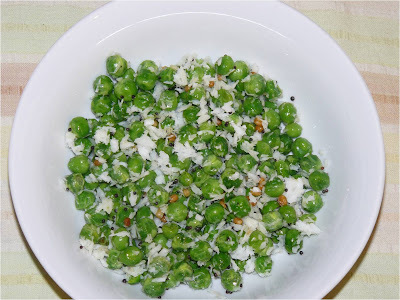 Add boiled green peas, grated coconut & mix well. Delicious and my fav too..
WOw very simple,healthy and new recipe . Pattani sundal looks yummy, thanks for sharing, never tried sundal with green peas.. Delicious!! The peas look wonderful! !